Does anything finish off a room quite like a perfectly framed piece of beautiful artwork? We don’t think so. Here at Alison Bradley Gallery, we always enjoy working with interior designers and their clients to find that special piece of framed artwork to compliment their new room. On this page we have brought together a few examples to demonstrate how we can contribute to design projects, please scroll down for more. Alison has a wide portfolio of her original oils and charcoals available for your interior design projects. With her subjects including landscapes, cityscapes, coast, rural life and equestrian there is a range to suit different tastes and rooms. To view Alison’s work, look at the “Galleries” navigation tab at the top of any page on this website. If you’re looking for something unique and individual that is appropriate to Alison’s body of work, then she is always happy to consider requests for commissioned pieces to compliment your design. At Alison Bradley Gallery we offer a range of options for fine quality bespoke picture framing. Working with six moulding suppliers means that we have access to a huge range of frame moulding styles, sizes, and colours. We keep a range of samples in our galleries, but we are always happy to search for your perfect moulding if it isn’t on our display stand. Bevelled mirrors can also be supplied in matching frames. Handmade swept frames are the ultimate in frame design and ours are available in almost limitless combinations of size, profile, and colour - including the Farrow and Ball® and Little Greene® ranges. We only use fine quality materials in our frames, including pure cotton mountboards and specialist art glass. We love to breathe new life into old pictures - it’s amazing what effect a new mount, frame, and glazing can have. Very often a customer wants to retain existing artwork in their new room, and a reframe is the ideal way to integrate it. In the example above, the original and rather tired looking watercolour on the left was freshened and brightened up with a simpler and lighter mount, extra-clear low-reflection glass, and a new green driftwood frame. The reframed piece is on the right right above, and the transformation is remarkable - read about this project and reframing old pictures. Original and commissioned artwork can be a magnificent finishing touch for a new room, however not every project budget can accommodate this so we also supply a range of reproduction prints. We select about half of Alison’s original output for reproduction - mastering and production is all in house, meaning that Alison is in control from start to finish. Most of our prints are limited edition in a variety of edition sizes, and a few are open edition. Alison was approached by the Royal Oak Hotel in Betws-y-coed to provide a centrepiece for the refurbishment of their Grill Bar restaurant. The team at the Royal Oak are passionate about the food they serve, they are great supporters of local farmers, and they wanted a picture that represented their pride in what they do. The subject was a Welsh Black Bull in charcoal with the overall frame size to fit a particular panel in the restaurant. The bull needed to be magnificent, standing proud, and with his horns intact - this last point was quite tricky because nowadays most are polled. Alison worked with the Welsh Black Cattle Society to find the right specimen, and the result was “Black Ox” which is now hanging proudly in the Grill Bar. To complete the project, a number of small prints and documents were reframed to compliment the new scheme. We can tell you from experience that the Royal Oak team are right to be proud of the food they serve - it’s delicious. Alison was approached by the owners of Ty Ucha holiday cottage when they were approaching the end of their renovation project. They had seen some of Alison’s original charcoal drawings in the gallery and decided they would like a selection of originals and prints as the finishing touch for their cottage. A site visit was arranged and, with the help of some photos in advance, a shortlist of suitable frame mouldings was established. Ty Ucha is a large former farmhouse, finished to a very high standard with lots of stone and slate inside, so all the pictures were framed in a distressed dark silver moulding - the colour and texture being a perfect match. 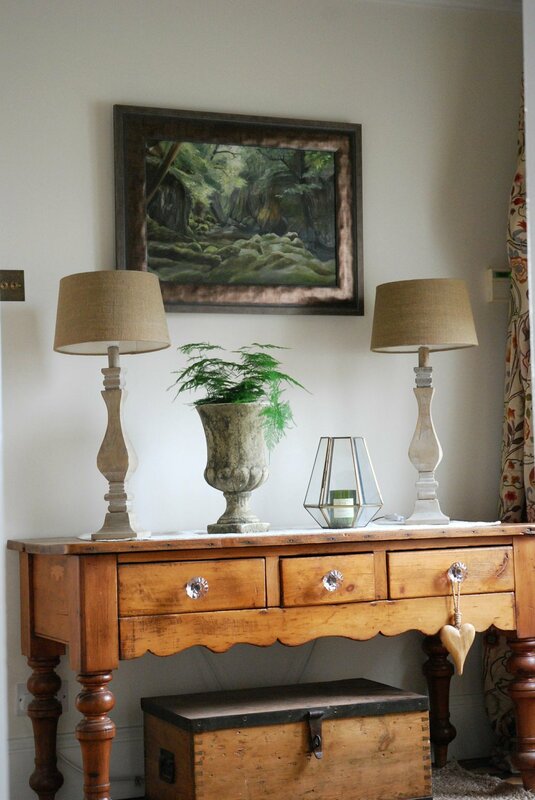 The final portfolio was two original landscape charcoals either side of the wood burner as a focal point with eight rural-themed charcoal prints throughout the property to compliment. Ty Ucha is a 5* property sleeping 8, in a quiet rural location convenient for exploring all of North Wales. We can supply whatever you need for that special finishing touch for your project - from a single framed print up to multiple commissioned pieces in the grandest swept frames. Trade terms available for bona-fide professional interior designers - please enquire for details. We are happy to work with you the designer or directly with your client in order to find the right pieces to compliment the design scheme, including site visits within reasonable distance of our galleries. We are always open to new ideas, so if there is something we haven’t covered, please ask. Q - Do you charge for site visits? A - Depending on the size of the project, we will offer a free site visit within reasonable travelling time from our galleries. Visits further afield may be subject to travel expenses. Q - Can you advise frames and mounts to suit a mood board? A - Yes, actually this is great because we can really get a feel for the room. Q - Do you only work with UK designers? A - No, we are happy to work worldwide. Clearly, site visits are more difficult, but we can liaise online. Q - Do you offer trade terms to interior designers? A - Yes, trade terms are available to bona fide professional interior designers - please enquire for details. Q - Can work be hung in direct sunlight, e.g. in a conservatory? A - We can supply Museum glass with over 99% UV protection. For unglazed oils, Alison can advise for each case. Q - How long does a commission take to complete? A - It varies - a few weeks to a few months. Please submit an enquiry below and Alison will advise an estimate. Q - All the work on Alison’s website is single panel, would she paint a tryptich? A - Yes, she would be happy to do this if the commission is appropriate to her body of work. Q - Would Alison paint a mural in situ? Q - Can you accommodate urgent requests? A - If time is short we will always try to help, but frame and mount choice may be limited. Q - Do you frame work by other artists? A - Yes, we are happy to frame and reframe work by other artists. We do not currently frame objects, e.g. shirts. Q - Can you deliver artwork? A - Yes, we deliver worldwide. Q - Can you supply security fixings? A - Yes, we can supply a range of fixings as required by each project.